The QR code appears on a page appended to your signed document. It embeds a link you can use to navigate back to Legalesign to affirm the document later. PDF Certification now largely obviates this feature, but it can be a secondary or back up means of document authentication. Admins can change the team default to remove it. Go to Admin > PDF Security > Append, find the entry for "Append Legalesign validation and signer info", untick the checkbox and save. 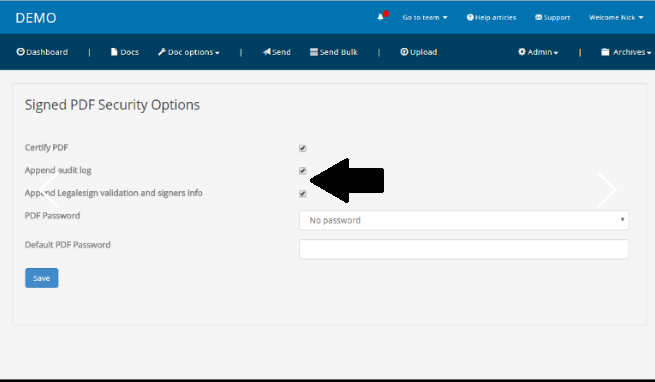 You can access and export an audit log of a signed document anytime by going to a document details page (click on document title in the dashboard or archive), and then scroll to Audit Log. Click the option Audit Log only PDF download. You can stop the audit log from being appended to the document too. Just untick "Append audit log" in the same page.